Located in the gated community of Formosa Gardens, this 6 bedroom 3,007 sq. ft. the home is located only a couple of miles from all of Orlando’s other world-famous attractions. Also downstairs there are 2 comfortable king bedrooms and 1 queen bedroom. Upstairs there is 1 more king bedroom, 1 twin/twin bedroom and 1 full/full bedroom. Each bedroom is decorated to please, along with TVs in all of the bedrooms. Outside, you have your own private pool, complete with a spillover spa and screening around the deck. You can lounge or dine al fresco under the lanai, or enjoy the warmth of the Florida sun. Make Formosa Retreat your next home away from home. 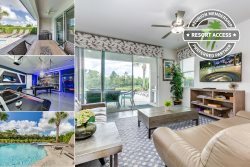 Formosa Gardens Estates - A peaceful upscale community with vacation homes just 3 Miles from Disney and close to other Orlando area attractions. Follow Formosa Gardens Blvd to the Formosa Gardens Village where you'll find convenient shopping, dining, and more.